Agasthya Maharishi is revered as one of the great Saptarishis. He is one of the first seven direct disciples of Adiyogi, and is believed to have hailed from South India. He has been a great driving force in taking yogic sciences across the Indian subcontinent about 15,000 years ago. 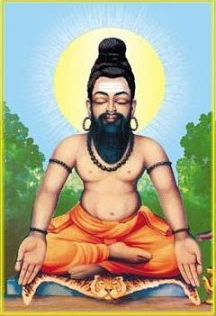 More importantly, he is considered the father of South Indian mysticism and its many disciplines which explore both spirit and matter in great depth. His views and approach to each of these disciplines are too broad-based and egalitarian even for modern-day thinking. Maharishi Agasthyar is also considered as one of the foremost exponents of the martial art Kalaripayattu that is still practiced in present-day Kerala and Tamil Nadu. Unlike other martial arts, which are mostly about training the human body and mind to engage and defeat an opponent, Kalari is taught as a complete science with instruction on human anatomy and physiology. Maharishi Agasthyar is credited with having created a whole system of health and wellbeing based solely on the usage of mantras. Lalitasahasranama, Adithyahrudayam, Saraswatistotram etc are his contributions which are recited even today for health, wealth, higher knowledge,wisdom and victory over internal as well as external enemies. Maharishi Agasthyar has made immense contributions to the field of medicine and astrology - especially Naadi Astrology.